The world of product fundraising has changed dramatically over the past ten years. What used to be confined to a small array of choices for the organization or school —candy, gift wrap, magazines and catalog sales –is now a bewildering array of products and services, with no standardized profit model. In the US and Canada, there are currently more than 2,000 fundraising companies in operation! If you have no idea where to even start to make sense of the offerings, read on! First, take a deep breath. Although the fundraising space is crowded, this actually works in your favor. Competition means that the deals get better for the schools and organizations raising money. 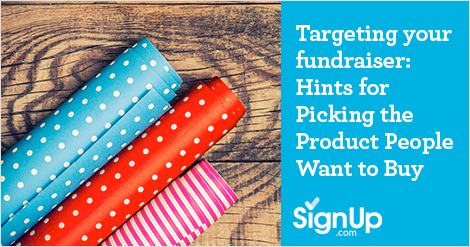 You can have your pick of any fundraising product out there –but be careful, because here’s where it gets tricky. You could strike the best deal in the world with 100% of all sales going directly to your organization, but if the product is shoddy, or a mismatch for your audience, you won’t see the results you’re hoping for. And unfortunately, it’s possible to do real harm to your long-term fundraising success by choosing inferior products, or choosing your product based solely on the percentage of profit your organization will keep. Who will be interested in buying the product? Kids, families, co-workers, neighbors and grandparents? Does the product price point match the income level and giving budget of your community? Does the product match the lifestyle of your audience? Do you have enough constituents who want what you’re selling? Examine the quality of what you are selling, does it fit the audience’s expectations? Is there potential for your buyers to support you every year? Offering only the finest, best-quality bulbs and plants available from growers in Holland and the U.S, Flower Power ships directly to your buyers at the exact right time for planting which takes the guesswork out of the equation and eliminates a major distribution headache for you. There’s no minimum order, no upfront cost and the products are 100% guaranteed so there’s no risk! Plus, there’s expert support available through the company and a built-in reason for repeat patronage! There are a lot of choices when it comes to picking the right product for your organization’s fundraising campaign, but you can’t go wrong if you choose your product based on the end user first, and then factor in which company is the easiest to partner with in launching your effort. Choose a quality product that appeals to your audience and a company that makes it easy for you to sell,and soon you’ll have all the funds you you need to serve your mission. Looking for more great fundraising ideas, check out Go Green with Earth-friendly Fundraisers.